The Commonwealth Bank’s role as adviser to Australia’s biggest coal project, Adani Mining’s proposed Carmichael Mine in Queensland, has ended, dealing a heavy blow to its prospects and a significant victory for environmental groups. It comes as environmentalists claimed a victory in their case against the project after the Federal Court overturned Adani’s federal environmental approval. Environment Minister Greg Hunt was forced to concede defeat for not taking into account two threatened species – the yakka skink and ornamental snake – before he signed off on the project in 2014. Fairfax Media has confirmed that Commonwealth Bank’s mandate with the Indian conglomerate Adani had ended, a decision which now casts doubt on the likelihood that Adani will be able to raise the $16 billion required to build Carmichael and the attending infrastructure such as the rail line and the port facilities at Abbot Point on the Great Barrier Reef. “As part of Adani’s refocusing of the project on gaining the various outstanding approvals, the financial advisory mandate has ended,” said a spokesperson for the bank. The bank declined to elaborate on the circumstances of its withdrawal but sources said the environmental controversy surrounding Carmichael and the project’s financial risk in the face of tumbling coal prices had been concerns. An Adani spokesman said it was “inaccurate” to suggest CBA had walked away, insisting Adani had terminated the mandate. It had done so “on the basis of its own concerns over ongoing delays to a now five-year long approvals process here in Australia”, he said in a statement. He added that Adani valued its partnership with CBA. CBA announced it had tightened its environmental and social governance policies at its annual shareholder meeting last November. The end of CBA’s relationship with the Indian power company could make it more difficult for Adani to attract investment from other banks. CBA is Australia’s largest lender and a leading banker to resources projects around the country. Many of the world’s biggest coal project funders – Citigroup, Deutsche Bank, Morgan Stanley, RBS, Credit Agricole, BNP, Barclays, Goldman Sachs, JP Morgan and Societe Generale and HSBC – have already said they would not fund the development of a coal project whose export facilities were to be built near the Great Barrier Reef. While the government and Adani are describing the court ruling as a “technicality”, environment lawyers say it could expose both parties to a fresh wave of court action if the minister does not consider other new information that has come to light since he first approved the project. The Mackay Conservation Group launched its legal challenge in January. The group alleged Mr Hunt should be forced to consider the impact of greenhouse gas emissions from the burning of coal from the mine and Adani’s poor environmental track record in India, and that he had failed to examine an assessment on vulnerable species. Mr Hunt, Adani and the Mackay Conservation Group agreed the environmental approval should be set aside by the court because federal environment law required the impact on the species, in this case the skink and the snake, to be assessed. Both the government and Adani are putting the setback down to a bureaucratic bungle, saying the assessment had been done but the Environment Department failed to include it in the documentation it gave Mr Hunt. “It is regrettable that a technical legal error from the federal Environment Department has exposed the approval to an adverse decision,” Adani’s spokesman said. But it creates a new hurdle for Adani, with environment groups now pressuring Mr Hunt to reject the mine altogether. “A lot of new information has emerged since Greg Hunt made his approval and we call on him to now reject the mine,” Mackay Conservation Group coordinator Ellen Roberts said. That information includes statements to a separate Queensland Land Court case, which heard Adani had inflated the number of jobs its project would create and that its environmental assessment underestimated the damage it would cause to the habitat of another species – the southern black-throated finch. The Mackay Conservation Group is also calling on the minister to consider the economic viability of the project, and its other claims regarding Adani’s environmental history and the impact emissions from burning coal would have on the Great Barrier Reef. “If the minister is going to reconsider this project, he ought to do so taking into account all of the relevant impacts associated with the mine or he may expose himself to further legal action,” principal solicitor Sue Higginson from the Environmental Defenders Office of NSW said. On Wednesday, the Queensland government continued to praise the project, despite growing scepticism in senior ranks that it will proceed. “We are extremely disappointed that there has been this delay to Adani in the Galilee Basin,” Mines Minister Anthony Lynham said. Fairfax Media revealed last week that Adani had begun sacking most of its staff at its Brisbane headquarters. This followed the suspension of Adani’s project manager Parsons Brinckerhoff, its construction partner and potential investor Posco, and four engineering firms. 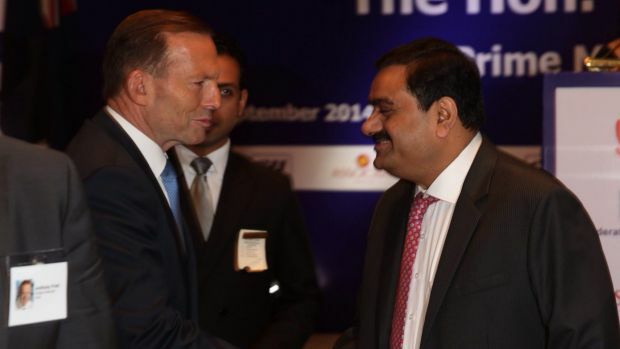 While the project has been praised by both sides of politics – including Prime Minister Tony Abbott, who called it a poverty-busting “miracle” for India’s poor – there have been growing calls for federal and state inquiries into decisions around the project given the growing body of information that has been exposed about Adani’s environmental and corporate practices. A Fairfax Media investigation in February raised questions about the ultimate ownership of Adani’s assets in Australia, as well as the transparency of its corporate structure. Confidential Queensland Treasury documents revealed in June that treasury officials had also expressed serious concerns to the Queensland government about Adani’s transparency and ability to finance the project.